US retail sales rose 0.3%MoM in April, which was in line with expectations, but there were some nice upward revisions to March’s data from 0.6% growth to 0.8% growth. Importantly, the 'control' group, which excludes very volatile items such as food, autos, building materials and gasoline, and supposedly better matches consumer spending within GDP, was up 0.4% after a 0.5% gain in March. February was revised up a tenth of a percentage point too. Retail sales have been difficult to interpret for much of the past year. In particular, Hurricanes Harvey and Irma caused extensive damage that triggered a wave of spending as households replaced lost items in Sep-Nov 2017. 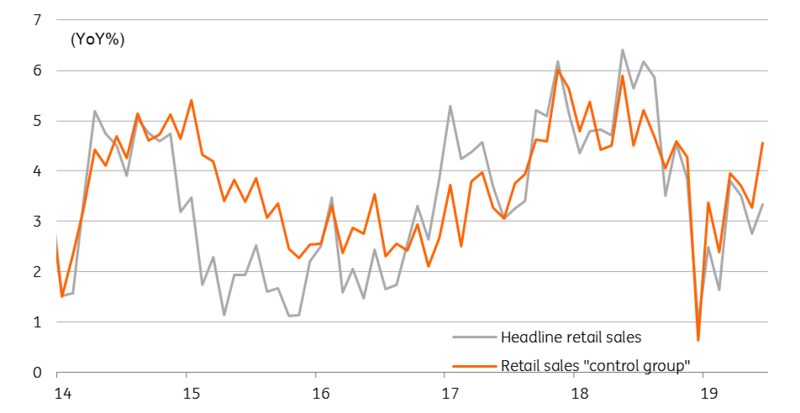 In fact, headline retail sales soared a cumulative 3.5% during the period only to fall back in Dec, Jan and Feb (although Feb has now been revised up to being flat). Now that these distortions are out of the way we expect forthcoming data to show households continuing to spend strongly. Employment is rising, wages are growing and tax cuts mean there is more cash in people’s pockets. With consumer confidence at strong levels, consumer spending growth is a key factor behind our above-consensus 3% GDP growth forecast for the US this year. In turn, this leads us to look for a further three Federal Reserve rate rises in 2018.